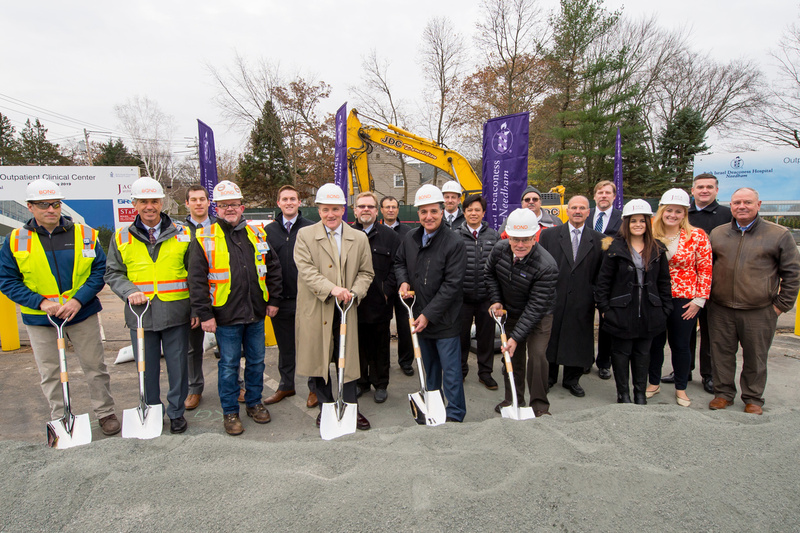 (Boston, MA) – BOND, the Northeast’s premier building, civil, utility and energy construction firm celebrated the ground breaking of the new Beth Israel Deaconess Hospital–Needham (BID–Needham) Outpatient Clinical Center. The ceremony was attended by members of the BID–Needham community, administrators and staff as well as the BOND project team and design partners including JACA Architects, Bard Rao + Athanas and Nitsch Engineering. The new Outpatient Clinical Center is planned to open in the Spring of 2019 and is the third project delivered by BOND and JACA Architects within the last ten years. Other recent BOND/JACA projects on the BIDH–Needham campus include the Cancer Center and Surgical Building in 2014 and the BreastCare Center in 2016. These projects are part of the Hospital’s overall strategy to redevelop and transform the Needham campus, bringing state-of-the art care to Boston’s western suburbs.